Is the MHFM a legitimate New York domestic not-for-profit corporation? Most Holy Family Monastery is a New York Domestic Not-For-Profit Corporation filed on August 20, 1993 under the business type heading “religious organization”. The company's filing status is listed as “Active” and its File Number is 1751088. Did Joseph Natale (founder MHFM) attend the St Vincent Archabbey in Latrobe, PA, USA (a Benedictine Monastery)? Joseph Natale attended the St Vincent Archabbey from July 7, 1960 until August 1, 1960. On page 3 of the PDF obtained from the St Vincent Archabbey in 2012 it confirms/states officially that Joseph Natale was only at their Archabbey for less than 1 month. Did Joseph Natale complete his training and take his vows, becoming a Benedictine monk, at the St Vincent Archabbey in Latrobe, PA, USA? On page 3 of the PDF obtained from the St Vincent Archabbey in 2012 it confirms/states officially that Joseph Natale was only at their Archabbey for less than 1 month. This is definitely not enough time to complete the "formation" which normal requires 6 to 8 years. Candidacy - the initial stage in which a man inquires about the community (through phone calls and/or letters) and begins his preparation for entry into the monastery. Eventually, visits will be arranged in which the candidate can live with the community and experience life in the monastery. During this time he is to prepare his documentation (sacramental certificates, medical, academic as well as references) and have a plan in place to satisfy any financial debts. Postulancy - after all the documentation has been collected and the candidate desires to enter the monastic life, he can begin to live with the community. During this time he will become more familiar with the daily schedule and the demands of monastic life. Novitiate - under the guidance of a novice master, to help the candidate recognize the gift of his vocation, a one year period of preparation is begun for the profession of monastic vows. The novitiate year will include further formation on the Christian life, prayer, the vows, the Holy Rule, and the life and history of the congregation. Temporary Profession - after the novitiate the novice makes the profession of monastic vows. Each year for three to six years, the vows can be renewed in preparation for the Solemn profession. During the years in temporary profession, guided by a director, the junior monk continues his formation in the monastic life. During this time he may also begin or continue studies in preparation for the priesthood or other areas of academic fields or vocational training. Solemn Profession - after three or more years of temporary profession, the junior monk presents a written petition to be accepted for the solemn profession of vows. If he is approved by the community, he can profess vows which will bind him to the commitment of monastic life. The solemnly professed monk continues to use the “tools of the spiritual craft” perfection in monastic life and Christian virtue. If the monk has completed his education at a seminary, he would be eligible for ordination to the priesthood after his solemn profession of vows. Did Joseph Natale receive permission to start his own OSB from Archabbot Strittmatter at the St Vincent Archabbey in Latrobe, PA, USA? 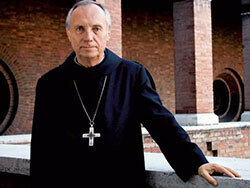 Joseph Natale did NOT receive authorization from Archabbot Strittmatter to start his own Benedictine Order. On page 4 of the PDF obtained from the St Vincent Abbey you will find that Joseph Natale had requested Archabbot Strittmater to support his idea of starting a "congregation for handicapped men". Archabbot Strittmatter response can be found on page 5 where he does state that he encoraged his efforts. But he also stated that he should "proceed carefully under the guidance of the Monseigneur Tolino of the Annuciation B.V.M. Church in Philadelphia, PS, USA. There was no mention at all of him starting his own Benedictine Order. ... Thank you for your request regarding Mr. Joseph Natale (a.k.a. "Br. Joseph Natale, O.S.B.") and "Most Holy Family Monastery." Mr. Natale was a novice (candidate for the monastic life, but not a vowed religious) at Saint Vincent Archabbey in 1960. He left the community of his own will. He was neither sent out nor was he given any form of permission by Archabbot Denis Strittmatter, O.S.B., to found any community of Benedictine Monks. We have no records of Mr. Natale other than his brief stay as a brother candidate in our novitiate. We have no records in the Archives of the American-Cassinese Congregation concerning the "Most Holy Family Monastery", its founding or "Br. Joseph Natale, O.S.B." I hope this helps you! May God bless you! CC: Abbot Timothy Kelly, O.S.B., Abbot President. CC: Archabbot Douglas R. Nowicki, O.S.B. Is the MHFM a legitimate Catholic Order of St Benedict (OSB)? The so-called Most Holy Family Monastery in Fillmore is clearly not an officially recognized Benedictine monastery, but a heretical sect. Unfortunately we cannot forbid no one to call himself "Benedictine“, even if he is not within the Benedictine Confederation, as long as he claims to follow the Rule of St. Benedict. "Benedictine monastery" or "Ben. Order“ is no legally protected expression. And the Abbot Primate has no jurisdiction over other monasteries. By the way, St. Vincent Archabbey from which Bro. Joseph came is still a very flourishing monastery. By the way there are no "Benedictines of the New Ordo“, we just follow the Rule of St. Benedict as ever. There are a number of such reactionary groups. Such is human life ... But those people look devout, know everything of the mystery of God, they claim to have got the truth. They judge on everyone as if they were God themselves. The real problem: They are demanding obedience and don’t obey the Church. One time I got so sick of saying this that, I knew I was lying, it just didn’t make sense. What? That doesn’t make him Benedictine. I said … “Just because you call yourself Benedictine doesn’t make you Benedictine.” I knew we were lying on all those excuses. And he (Michael) even dropped the O.S.B. (Order of St Benedict) for a while and then he picks it up again. He (Michael) went before Father Wickens (?) to make him a Benedictine, but Father Wickens (?) isn’t a Benedictine. Then he went to Father Bernard, who said he was like Benedictine, a traditionalist sort-of, to try and do vows before him, to give him legitimacy. Brother Joseph went to Latrobe, Pennsylvania, and he was kicked out for disobedience, and for a good reason too. He wanted to be a priest but he was a cripple. A cripple cannot be a priest. Is it required that an Abbot/Superior of an OSB be an ordained priest? On page 55 in the 1910 “Declarations on the Rule of Our Holy Father St. Benedict and Statutes of the American-Cassinese Congregation” / permissu superiorum (by permission of the superiors), also approved by the HOLY SEE. Was Joseph Natale an ordained priest? But it was definitely in Joseph Natale's business plan for him to become a priest. In the video (19:00-20:23) Joseph states that to develop his community the Superior needs to be ordained to the priesthood. “It sounds contradictory … I’m very frightful, but I’m willing to go and be ordained. I don’t look at the priesthood in a sense for any glory. You know a guy goes into the army or wears a uniform or something … he’s there strutting down the street thinking he’s something, somebody. But I think about the priesthood for myself … it frightens me, like I said before, but what can be accomplished, as far as the Sacraments are concerned, for my own good and for others also. To truly develop a community, a Superior being ordained and even possibly eventually become to be an Abbot. “But a Superior is a lonely job and his source of comfort, his source of wisdom, his source of knowledge must come from God himself. Was Joseph Natale a legitimate / valid OSB Abbot/Superior? Absolutely Not! He died before being able to accomplish that part of his dream. Was Joseph Natale a Sedevacantist? "The Church right now is fragmented. We must teach Catholics, traditionalist Catholics we may use that terminology, I’d rather use the word Roman Catholic. We must unite. We must, if we do no unite and come together and working for one goal and that goal is the Holy Mother Church, upon this rock I will build my Church, Peter. We must maintain that structure. We must uphold that structure no matter what the cost may be. We must uphold the structure of the Papacy. And we must try to unite the Church not fragment it." Did Joseph Natale support the need for Pastoral Care and set his Monastery (MHFM) up to ensure it? "That’s the biggest problem, I think, God has with us. We don’t always obey. We prolong things to our own doubts, our lack of understanding and so on … but we go through that process, the process of growing, developing." "So getting back to this community, this is as far as the Latin Tridentine Mass is concerned, as you see people looking, hunting for what they once had ... why should they be denied this? This is the way they want to worship. This is the way they’ve always worshipped. And they want to continue to worship in the same manner. That was my responsibility also to give it to them, to hold them together, to preserve what they knew to be Catholic and their Faith. When you look into their eyes you saw them crying out. It’s a matter of their salvation. And when you see people crying out at a matter of salvation, even by the law of the Church, we cannot turn our backs upon these people. When it’s put down as a matter of salvation we must do everything in our power to preserve the faith and their salvation." "This is a responsibility and we must uphold that responsibility. We cannot shun it and say “no you have to do this” and lose those souls. You cannot lose them. There is room in the Church, there should be room in the Church, as far as the Catholic faith is concerned, even after the changes came about, we cannot say or the Bishops cannot say … “oh forget about those people”. So I couldn’t see possible, to go along with the trend and the changes, to deny those who were being denied their heritage." Is Frederick "Michael" Dimond an ordained priest? Is Frederick "Michael" Dimond a legitimate / valid OSB Abbot/Superior? Was Frederick "Michael" Dimond always a Sedevacantist? Absolutely Not! The 1996 video of the Bro Michael Dimond speaking in the capacity of the Superior of the MHFM says it all. I can no longer show you the video as the the MHFM has filed a complaint against "The Crossroads at 23rd Steet" with YouTube; claiming copyright infringement for presenting to you the facts they do not want you to hear. So now I present you the text of what Frederick Dimond (a.k.a. Brother Michael) said in that video. "One of the errors that is prevalent is Sedevacantism which I want to cover that area." "Sedevacantism which means a vacant seat or the “Seat of Peter” which a true pope sits upon is vacant. There is no question about it. The Seat of Peter has been vacant in different times of the Church and is always vacant when a new pope is being elected; after a pope has died or in a conclave. The sedevacantist line is that there has been no pope since Pope Pius XII. Manifest heresy automatically or ipso-facto effects an excommunication for anyone in any office. And the Church has the right from God to separate itself from the heretical pope and consequently to apply all of the means that are in and of themselves necessary for such a separation. But in the case of the pope the determination that the person has lost his position has to be made by the Universal Church, most probably through a declaration from a general council or stated by a future pope before Catholics could arrive at such a conclusion." "You have the example of Saint Peter, for he denied Our Lord three times to the point of cursing and blaspheming but he didn’t lose his position. And by the way Padre Pio told John Paul II, when he was a priest, he said “one day you’ll be pope”. Now he didn’t say that he’d be a good pope … he just said “you’ll be pope one day”, that’s all he said. So that’s even a strong indicator in itself that they (sedevacantists) are definitely wrong." "Sedevacantists claim simply that there is no pope anywhere in spite of the fact that there hasn’t been anything to keep the real pope from coming out in the open. Most sedevacantist cannot and do not even try to come up with anyone who may be the pope. ???? In a word there is no divine promise that the pope will not be permitted to use his great authority in the most wicked and destructful ways. Such a pope, however, despite all and any manner of unholy action, would not lose his legitimacy, his all-encompassing jurisdiction or the divine prerogative of infallibility. So that should a devout conspirator become the Roman Pontiff he might be reconverted, he might immediately set about repairing the damage that he himself had inflicted upon the Church; without needing to be reelected, reinstalled or reconfirmed in his office. Only his private confession and absolution from censure; which means any penalty he might have incurred would be required." "The wide spread notion that anyone who incurs ipso-facto excommunication is thereby out of the Church, no longer a member, and therefore loses all ecclesiastical offices, dignities, etcetera … is based on a fundamental misconception. “Once a Catholic always a Catholic” is a valid principle. A valid excommunication does not mean that the Church excludes the person altogether; but the person may not participate in the life of the Church (that is receive any of the Sacraments of the living or participate in the liturgical ceremonies or take part in Church functions, etcetera)." "As regards to any offices their laws are for canonical condemnations only. Loss of an ecclesiastical office occurs immediately upon a declaration of “excommunication” and to be avoided, by the pope himself. Obviously the Supreme Pontiff cannot incur this censure but at the same time no one can justifiably blame even an errant pope for his sins. The failure of any person, even the pope, to keep God’s law or persevere in his own faith does not excuse any other for his failure to do the same. And if they do not convert they will surely perish. And we know this is predicted so the thing is we know this is predicted by ”Our Lady of the Salette” on September the 19th 1846 that Rome would lose its faith and become the Anti-Christ. So the main thing of all these things is to keep the Catholic faith and to uphold what’s always been taught." So you should agree that the MHFM was not established by Joseph Natale as a sedevacantist organization. Frederick "Michael" Dimond became a lay person within the monastery, swearing to uphold the monastery rules and beliefs, as an anti-sedevacantist traditional Catholic. As Joseph Natale supposedly started his monastery after "speaking with God" ... it would appear that God did not believe in sedevacantism either. So ask yourself, why would Frederick "Michael" Dimond change the MHFM's position after its founder's, Joseph Natale's, death? Did Frederick "Michael" Dimond create a schism within MHFM by betraying Joseph Natale and becoming a Sedevacantist? Absolutely ... without a doubt! Robert "Peter" Dimond, Fred's brother, in March 2010 tries to explain away the radical divergence from the so-called "prophetic" anti-sedecvacantist teaching and beliefs of Joseph Natale in the video ... but only a fool would believe the explanation. The truth is that Frederick "Michael" Dimond kept the name (MHFM) but not the initial / intended design and purpose of Josep Natale's monastery. "This is Brother Peter Dimond, vaticancatholic.com, and we wanted to address the issue “was Brother Michael Dimond always a Sedevacantist”? This issue becomes relevant, every once in a while, because you have certain individuals who, since they have nothing else to say, they bring up the fact that, well, 14 years ago Brother Michael Dimond wasn’t a sedevacantist. And that’s true. As we’ve pointed out it’s a logical progression for people to go from non-sedevacantism to sedevacantism because it’s the duty of every Catholic to accept the man who purports to be the Bishop of Rome as the pope unless there is clear evidence of an invalid election or manifest heresy. And so, if someone is supposedly elected by the supposed College of Cardinals and installed as a supposed pope it is the Catholic’s duty to accept and acknowledge him as the pope. And so it would be a logical progression for people to go from holding the position that that some of these Vatican catholic popes are true popes until they come across the evidence which persuades them, convinces them that they are not popes. And that was the case with Most Holy Family Monastery, in fact, before I entered Most Holy Family Monastery, this was as I said about fifteen years ago, quite a long time, I’ve been here about 12 years and so when Brother Michael entered Most Holy Family Monastery it was traditionalist but did not hold the sedevacantist position but not long after, he took the sedevacantist position after learning more about the issues." "But in 1996 he gave a talk he discussed various traditional issues and in fact it was in that talk that he denounced John Paul II as an outright heretic. He condemned the New Mass as invalid. He rejected and clearly set for the evidence that “Baptism of Blood” and “Baptism of Desire” are not consistent with the Catholic Church’s teaching on the absolute necessity of water baptism. And he also spent a few minutes on the sedevacantist issue." "At that time he was not persuaded that that (sedevacantism) was correct. This was in 1996 and so he was actually quite young and somewhat new to these issues. But he had read Father James Wathen’s book “Who Shall Ascend?” and he eventually met Father Wathen and spoke with him. And he had a lot of respect for Father James Wathen, at the time, because Father Wathen was one of the only priest in the world, in fact, who had never accepted the New Mass. He condemned the tenets of the New Mass as mortally sinful. Wathen also rejected Baptism of Desire and upheld the absolute necessity of water baptism and he condemned this idea that souls who were ignorant of the Gospel and ignorant of the faith can be saved, in any religion; which even the few sedevacantist priests, at that time, all believed; which was an additional reason why Brother Michael had had no respect for them at the time." "Wathen also called John Paul II an outright heretic, not a material heretic, and condemned NST (?). And so he really deferred to Wathen and he thought that Wathen understood the issue of sedevacantism, and he’d been studying it for years. He had been a priest for many decades and a traditional priest. Wathen was correct on almost everything but the air that he held was this idea that heretics don’t lose authority in the Church, don’t lose membership in the Church (“Once a Catholic always a Catholic”) and applying that to the man who claims to be the pope." "And so that’s what Brother Michael believed was the catholic teaching at that time. And at that time he had not studied the teaching of the Church on loss of Papal Office through heresy. And that’s why he did not believe in sedevacantism. But it was shortly after that, about a year later, that after studying the issue more, or in understanding more, about Church teaching, especially as it applies to heresy, loss of office, Church membership that he changed his position and became a sedevacantist." "And so you have these pathetic heretics and some of them are just obsessed with us, frankly, we had to disable comments. We disable comments for a number of reasons because we believe, as we said in the other video, it can be counterproductive, because you have people wasting their time being corrupted by liberalism, etc., of other people. But also because we have people who will literally create e-mail addresses and YouTube channel and pages every day to try and spread lies about us posted on our channel." "Okay … we had a guy who created 3 different YouTube channels in the space of 24 hours just to try and post lies; first – so that as many people as possible would see the lies about us. And so, the devil is really upset with what we are doing. You have all kinds of wicked people who, to the point of obsession, are trying to attack us. And so, some of these heretics can’t refute anything so the best thing they can do is to try and bring up something Brother Michael had said in one talk, 14 years ago, on a video we haven’t offered over a decade. And the often do it, in fact, sedevacantists even do this just because they’re either jealous of what we are doing, because they’re Schismatic, cause they’re evil and in fact the people who do it, the sedevacantists, weren’t even sedevacantists themselves at that time. And in fact they do it, some of these people, in such a way that they give the impression that Brother Michael was actually defending John Paul II, when he was a non-sedevacantist. No! In fact Most Holy Family Monastery was doing more to condemn him as a heretic, even when it was non-sedevacantist, than basically anyone. Basically the whole talk is condemning him as a heretic. It also condemned NST." "There is also the lie that is promoted that Brother Michael kicked someone (Richard Ibranyi) out of Most Holy Family Monastery for holding the sedevacantist position; which is not true." "And this brings up a crucial difference, and it’s something we’ve pointed out many times, is that the real measure of bad will, okay, is if you don’t denounce these guys as heretics once you see their activities, once you clearly see that they believe in salvation outside the Church, once you see that they endorse false ecumenism; okay, that is a sin, a mortal sin. It demonstrates bad will, okay. And so even when Brother Michael was not a sedevacantist because he was unaware of the Church teaching of loss of office, how heresy effects the loss of Church membership, how that applies to a claimant, etcetera, the true meaning of “no one can judge but the Holy See”, he was still condemning John Paul II as a formal heretic. And so the people who see the evidence and say that he is not a heretic are just lying. And the people who are honest enough, who are honest period, and admit that he is a heretic, well, it should only be a short time after that they, once they see the evidence on what the Church teaches on the implications of heresy, that they realize he can’t be a legitimate pope. And with our material we’ve laid it all out and answered all the objections. We’ve made it quite easy for people. And we’ve produced all the evidence for their incredible amount of heresies. And so that’s why most of the people that are sedevacantist today are sedevacantist through our work. Because we’ve handled all the stuff, they don’t have to be searching through, you know, these dishonest Society of Saint Pius X publications where you get almost no truth. And they’ll hide the” loss of papal office” quotes. They’ll hide all this truth and they’ll distort how so much misinformation has been spread through these non-sedevacantist publications; which don’t present the truth. And so with our material that’s why people now are getting to see the actual pure truth and they can sift through all the lies and false arguments and get to right what the Church teaches. And that is why so many of them have become sedevacantists." "And it’s rather interesting to note that you have a lot of these speakers who have converted from anti-Catholic Protestantism. You have them, uh. You have people who have changed their positons multiple times on these issues. We haven’t changed any position at all on an issue of core faith except from going from non-sedevacantism to sedevacantism many years ago; which is logical. And these people bring this up over and over again but they never bring up the fact that these people were anti-Catholic Protestants, etcetera. You also have people who don’t know us saith that we were raised as Protestants. We were not raised as Protestants. We were born into a non-Catholic family that is basically completely secular. And we don’t like to talk about ourselves much because frankly we’re not relevant. What’s relevant is what we put out, what we produce … the teachings of the Church. And so the family we were raised in was not Protestant. We never had an aversion to the Blessed Mother. In fact, when my brother introduced me to Catholicism, before I was even converted, when I was still in middle school, I was wearing the ???? and praying the rosary. I never had any aversion to the Blessed Mother. And so you have all these lies spread. We were raised in a completely secular family where religion wasn’t even a concern. And our parents were not Atheist, someone else said that. They were people who claimed to believe in God but didn’t practice any religion whatsoever. It was all about being successful and happy in life, period." "That’s an example of bad will. Because there is absolutely no excuse to say that those things, once you see them, are not heresy. That is not analogous to being unaware of what the Church has taught on ”loss of office”. And once someone sees that teaching, we’ve pointed out, then there is no excuse; because, as our material makes quite clear, a heretic is not a member of the Church. Popes must be members. And so … to persist in the position that, once you’ve seen the material on “loss of office” is to sin mortally and it is to deny the faith." The one critical point that Robert "Peter" Dimond forgot to mention or intentionally overlooked is the fact that Frederick "Michael" Dimond claimed to be "sitting in the place of Christ" at the monastery as Superior at this time. If that were actually true then he would have had the proper 6-8 years of formation required before becoming a monk as well as the ecclesiastical formation required before receiving the Holy Orders as an ordained priest; which in the video he inadvertently makes clear wasn't the case. Robert "Peter" Dimond explanation actually confirms the premis of this website; that being that the Most Holy Family Monastery is a counterfeit Order of St Benedict and that Frederick "Michael" Dimond is an Imposter Abbot/Superior. The MHFM today is NOT the MHFM that Joseph Natale created as a non-sedevacantist. Joseph Natale claimed to have spoken with God and set his monastery up accordingly. Frederick has not openly claimed to have spoken with God but it is evident, by the schism he's instituted, that he believed Joseph Natale was not a "true" traditional Catholic but rather a guilty of heresy.